When deciding to use a Tilt-Carrier, you need to know your towbar’s tow ball weight rating, which varies with vehicle and manufacturer. The combined weight of the Tilt-Carrier and a Golf Cruiser, which themselves have weights of 40 kg and 106 kg respectively, is 146 kg total. Ensure the added weight of any other accessories [such as golf bag/clubs] does not exceed 54 kg. If they do exceed this weight we suggest the golf bag/clubs is stowed in the vehicle’s boot or cabin. The Tilt Carrier’s main deck has maximum carrying capacity of 230 kg. The loading ramp of the Tilt-Carrier has a maximum loading capacity of 200 kg. 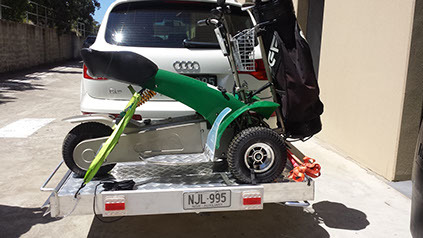 If the combined weight of rider, golf cruiser and golf accessories exceeds 200 kg, the cruiser should not be ridden onto the Tilt-Carrier, and only loaded/unloaded while walking alongside. Drive sensibly and with safety. Avoid driving quickly over large/sharp undulations and gutters in the roadway which may cause the Tilt-Carrier and its load to “bounce”. Do NOT exceed your vehicles tow bar capacity rating. Check its limits with the manufacturer. Use a hitch drop/riser if the vehicle’s hitch mount height is too high/low. See Tilt-Carrier Accessories on this website. Use an Anti-Tilt Bracket on the hitch bar to eliminate as much rattle/wobble as possible. See Tilt-Carrier Accessories on this website. Do NOT ride your wheelchair/mobility scooter/golf cruiser onto or off the Tilt-Carrier and only load/unload it while walking alongside. If the Tilt-Carrier & the wheelchair/mobility scooter/golf cruiser sitting on it obstructs the lights and/or number plate (Tail, Indicator & Brake Lights), you will need to install a Light Bar Kit to the Tilt-Carrier. See Tilt-Carrier Accessories on this website. Make sure you install a copy-number plate/identifier to the back of the Tilt-Carrier. The Light Bar Kit has a number plate light and number plate holder. Always tie down your scooter when it is sitting on the Tilt-Carrier. You can do this by using the strong ratchet straps that we can provide. 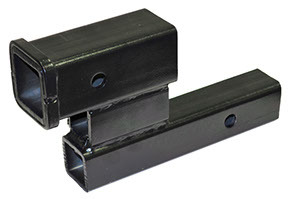 See Tilt-Carrier Accessories on this website. Take extra care when loading and unloading your wheelchair/mobility scooter/golf cruiser. Always look out for traffic. To reduce the loading ramp angle, load/unload from a curb-side raised nature strip if available. The vehicle’s rear overhang with the carrier attached must not exceed 1.2 meters from the rear of the vehicle, or 60% of the vehicle’s wheelbase, or 3.70m from the centre of the rear wheels, whichever is lesser. A flag may be required. Check with your local State transport department. When travelling without a wheelchair/mobility scooter/golf cruiser sitting on the Tilt-Carrier, move the Tilt-Carrier to the vertical position and move the Light Bar/Number Plate Holder to face the rear. As vehicle types vary, it’s up to you to make sure that you comply with the road rules at all times.